"You need to get to Scotland in winter".. a friend once told me. For someone serious about increasing their mountaineering experience, this is great advice. I only wish I went to Scotland sooner! Heavy packs and gear ready for action! That was six or seven years ago and since then more climbers and mountaineers I have met along the way have reiterated the same, making me even more curious. A seed was sown, all that was left to do is wait for the right opportunity. And wait I did! Several years until I met the right people with similar interests! Long story short - We booked the ferry and accommodation and began the ice climbers ritual of praying for ice! Ever since I started climbing I would watch youtube videos of climbers all over the world doing their art in amazing locations, I'd imagine myself in their shoes and dream of travelling to far away places for epic experiences. At first it was just rock climbing videos but with the internet these days its only a matter of time before you stumble on something different, something that really get's your attention. So why Scotland in winter? Winter in Scotland can be punishing. Imagine winter in Ireland, now imagine much worse. Further north, higher mountains, stronger winds.. A relative who lives in the outer Hebrides uses wheelbarrows as a measurement of wind speed! 1 wheelbarrow flying past the window = feckin windy! Getting away from the point though, most mountaineers go to Scotland in winter in the search of many things, most importantly; ice. 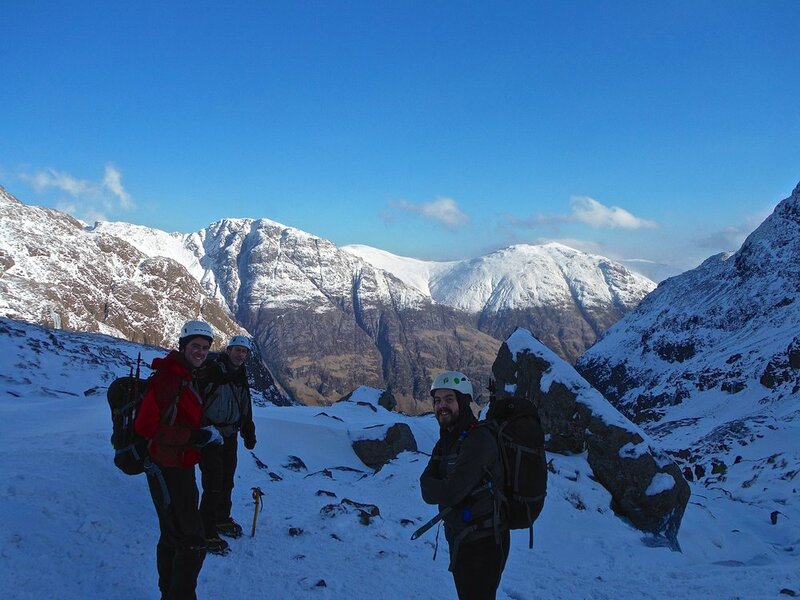 And sometimes if you're lucky enough as we were you will get days like this..
Scottish winter mountaineering is for some a pre-requisite for alpine mountaineering, for others a testing ground.. a challenge and experience of its very own. So when I began watching ice climbing videos I was fascinated and intrigued. Climbing walls of rock seems quite safe compared to climbing ice.. which is of course is just frozen water. I watched people like Uli Steck climb frozen waterfalls and iced gullies. "This is crazy, amazing but crazy" I thought. Well I like a little crazy.. "It's not something I'd try" I said to myself.. but there was a curiosity nonetheless. 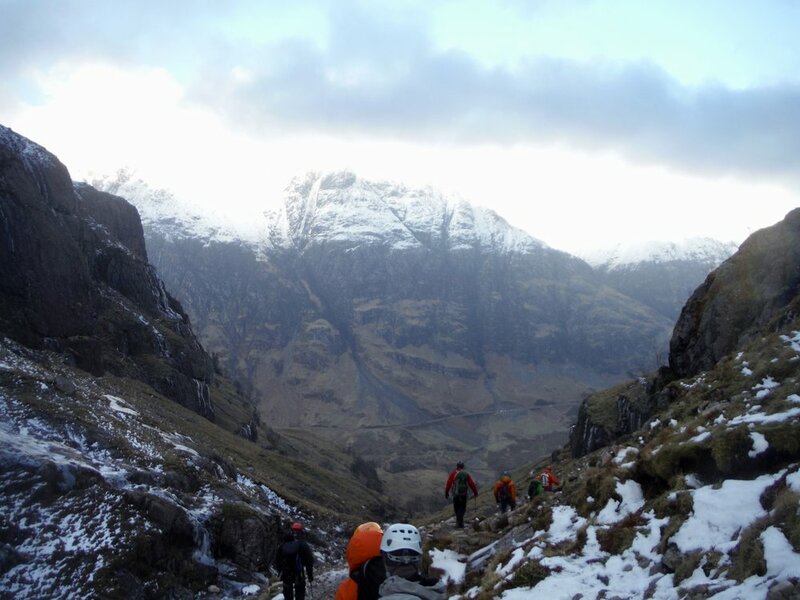 We spent our first day as a warm up day, hiking up to the CIC hut under the north face of Ben Nevis where we practiced basic skills such as self arrest rescue, axe use, avalanche, bucket belays and much more. I just wanted to get climbing! After an interesting few days we took a "rest day" and went to Icefactor for some ice climbing practice, coffee and cake! All it took to get me hooked! Me exploring the possibilities. Check the arms though, they should be straighter! So much for a rest day my arms were soooo pumped after 2 hours of climbing! Ice climbing is just another form of climbing. Climbers use ice axes to pick, hook and grip the ice and wear crampons (a metal plate with spikes fixed to a boot for climbing ice or rock) on their boots. Ice climbing takes place on frozen waterfalls, cliffs and rock formations covered in ice refrozen by water. Similarly to rock climbing the climber protects themselves with a mixture of rock climbing trad gear and ice screws. Expectations - the only problem with watching videos of the best climbers in the world is when you actually get off your arse and start climbing you realise you have a long long way to go to even come close! But keep dreaming and watching! Chris eying up the first tricky section. I really enjoyed this section, thin rib running straight up the ridge! As is with most outdoor sports we were at the mercy of mother nature and we adapted to the conditions as they changed. Unfortunately we did not get the best winter conditions but that didnt stop us. We definitely made the most of it. One thing is for sure I'l be back for some more! Note: Since the writing of this blog legendary alpinist Uli Steck tragically died in the Himalaya. RIP Uli "The Swiss Machine".